worst day of my life and seeing you completely changes my mood. 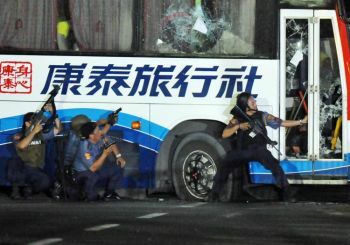 A fired policeman hijacked a tourist bus in Manila and killed at least seven passengers by the time the 10-hour siege ended on Monday night, local time. The gunman, Senior Inspector Reynaldo del Rosario Mendoza, seized the bus armed with an M-16 automatic rifle. Police later surrounded the vehicle, and a bloody gun battle ensued on the streets of the Philippine capital. The siege ended when Mendoza was shot dead. The bus was originally carrying 25 to 30 passengers, depending on reports, mostly tourists from Hong Kong. Nine were released early on in the incident. It was feared that there were none left alive after the Filipino driver escaped the bus shouting “all the hostages are dead!” reported Sky News. At one point in the afternoon, a body was left dangling out of the window of the vehicle. During the siege, Mendoza gave a live telephone interview with a local radio station, threatening to kill all the remaining passengers on board. “I can see there are many SWAT teams arriving, they are all around,” he said. Police eventually shot the tires from the vehicle, which led to the gunman opening fire on the passengers. At least seven were killed in the siege, AFP reported. A hospital also received the body of another woman believed to be among the hostages. Police have declined to give exact figures for the number of casualties. Mendoza boarded the bus in the city of Intramuros, and waited several stops until Jose Rizal Park before producing his rifle and declaring that he was taking charge of the bus. “Big deal will start after 3pm today,” he said, in a handwritten note pasted to the window of the bus. The Manila Bulletin, citing records obtained from the Philippine National Police, reported that Mendoza would have been months away from mandatory retirement at age 56. Over the course of his career, Mendoza had been decorated with 17 police service medals and a commendation for excellent job performance, the records show. “He was disappointed that he did well in police service but was dismissed for a crime he did not do,” he was quoted by news agencies as saying. According to the travel agency, Hong Thai Travel, the bus had 20 tourists from Hong Kong, three tour guides, a photographer and a driver. Police attempted to storm the bus several times, on one occasion using a sledgehammer to attempt to break the windows, but still failing to enter the vehicle. What celebrity would play you in a movie about your life? Who’s the most underrated actor? "Facebook and Youtube. But since I’ve already reactivated my blog accounts. I need to update them everyday"